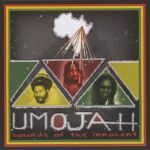 Sounds Of The Innocent is the debut release from the Virgin Islands group Umojah. Who Lock The Door 9. Cool Cat (Love Me Some More) 10. Sounds Of The Innocence 15. Umojah: Babs B, Clifton (Talawah) Constance, Lenn B. Production work done in Umojah BandHouse, St. Croix, U.S.V.I. Who Lock The Door - So fly high, high children, above the system. Loose those trails that lead you astray. You can't be a victim. Cool Cat - And who go the beat that the cool cat seeks. The humble lion. And whose got the beat that could groove the street. The humble lion. Take Head - Rise up wise up and take a little that's good and make a lot. One Woe - Throw a penny in your fountain. May your dreams come true. Wish upon a star now. Your genie come ah sing a song to you. Rock Soul Party - Then I know, got to know. The way you feeling, but this here music is full of ah healing. Said I know the crazy way yuh feeling inside but this here melody well it's part of the therapy now. Sounds Of The Innocent - 'Cause this here songs has been going on so long, too long now. And this ya moan and groans of the innocent been done in a screaming melody. Work - I work and I work. Lord knows my body's tired. I work and I work and lord knows how hard I've tried. Summer Time - This is the summer time of our lives. Let's get together lots of work to be done. This is the summer time of our lives. Make haste, make haste, winter soon come. Little Rivers - I'm ah gonna wash my sins away 'cause the rain it's ah coming on down. Who Are You? - World keeps spinning round and round. And things get turned upside down. Lessons we've learned along the way we sometimes don't remember. Why? - Someone tell me why? Made a nuclear world for the children to inherit, to inherit so much nuclear waste. What Are You Doing? - Brand new story almost everyday. THings you want to do along the way. But you better make a move my friend. Please don't sit and dream your life away. Rebel - Some ah rebel from Jamdown. Some ah rebel from London. Some go on like them ah rebels. But somehow we gonna back them off.